Alejandro Escovedo’s last studio album, The Boxing Mirror, was his first project following a nearly-lethal bout of Hepatitis C, and, accordingly, the album sounded just the way Escovedo’s fans expected it would-brave, ambitious, triumphant. Sure, it mostly avoided the sorts of navel-gazing and musings on mortality that brushes with death tend to provoke in artists, but make no mistake: With its bold creative vision and assertive force, it was a true survivor’s record. Likewise, Real Animal–the follow-up to Boxing Mirror, and Escovedo’s ninth album overall–is a survivor’s record, but of a different sort. This isn’t an album about Escovedo’s near-death experience as a Hep C patient; it’s an album about his near-death experience as a rock and roll singer. It’s a chronicle of the perils and the risks that a rock and roll lifestyle entails, a portrait of just how dangerous the muse can be. Understand that when Escovedo sings about a treacherous monster that lives in his own veins, it’s not the Hepatitis he’s talking about-it’s his unavoidable, irresistible calling to be a songwriter and performing musician. It’s tempting, of course, to call this an autobiography, and certainly, each song here is born out of personal experience-there are winking valentines to some of Escovedo’s old bands (”Nun’s Song,” “Chip ‘n’ Tony”), elegies for those who lost their lives to the bewitching rock and roll lifestyle (”Sister Lost Soul,” “Sensitive Boys”), celebrations of the communal tendency of music (”People”), gently funny odes to fidelity in the midst of an uncertain journey (”Always a Friend”), and, at the end, an impassioned plea for responsibility and restraint (”Slow Down”). When Escovedo references specific people and places, in songs like “Golden Bear” and “Chelsea,” he’s not just adding local color; he’s writing about his actual life. But this is no mere autobiography; this song cycle is a rich, meaningful myth–a myth that happens to be true, because it’s not just built from rock and roll clichés; here the artist is self-mythologizing, just as Elton John did on Captain Fantastic, turning his life into a story that’s rich in meaning. Only where John’s album was grandly theatrical, this one is marked by its authenticity, its humility, its earnestness. It’s obviously a very personal album, but it’s also a collaborative one; Escovedo wrote all of these songs with Chuck Prophet, and he brought in Tony Visconti to produce. Visconti, who helmed classic glam-rock platters by T. Rex and David Bowie, keeps the music rough, muscular, vibrant; it’s a lean set of songs, played with real rock and roll grit and the kind of howling urgency that only a real-life story could inspire. 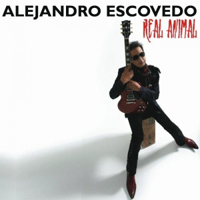 So when Escovedo celebrates the primal power of music on “Real as an Animal,” he and Visconti present it as a wild, primitive, Stooges-style assault. But just because this is a hard-hitting slab of rock doesn’t mean Escovedo and Visconti are afraid to explore different textures and sounds; there’s a lot of variety in the songwriting-like in the bluesy, folk sing-along of “People,” or the country-rock violin riffs of “Always a Friend”-and there are tasteful sonic details, like the saxophone at the end of “Sensitive Boys,” to make the album sound as rich and as full as the songwriting calls for. And how fitting that the record blends everything from Escovedo’s past-roots rock, glam rock, country, even punk-into something that looks to his own history not nostalgically, but with the eyes of wisdom and experience. There is joy to be found here, for sure, in the music itself and in the nods to love and purpose that dot these songs, but there’s also heartbreak and loss, grief over the price paid for recklessness and egotism. And that’s what makes this album not just the work of a survivor, but of a conqueror-someone who’s lived these songs and lived to tell about it, a better musician and a better man because of it.